I recently shared a classic green bean casserole recipe that should be made ahead and frozen before cooking. Today, you will love this gourmet green bean casserole that can still be made ahead, or make it early the day of, ready to heat and serve in about 45 minutes. This version will still satisfy lovers of the traditional green bean casserole. But added here for a little bit of elegance are diced red bell peppers, grated Parmesan cheese and caramelized shallots. I did wondered if the bell pepper would overpower the creamy flavor of this casserole we all love so much. 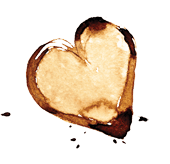 But it adds an excellent tang that is subdued with the cream sauce and cheese. Whether you assemble and serve this immediately or prepare it ahead to be heated just before the rest of the meal is ready, this could be a new favorite for your holiday table. Or any time, for that matter. 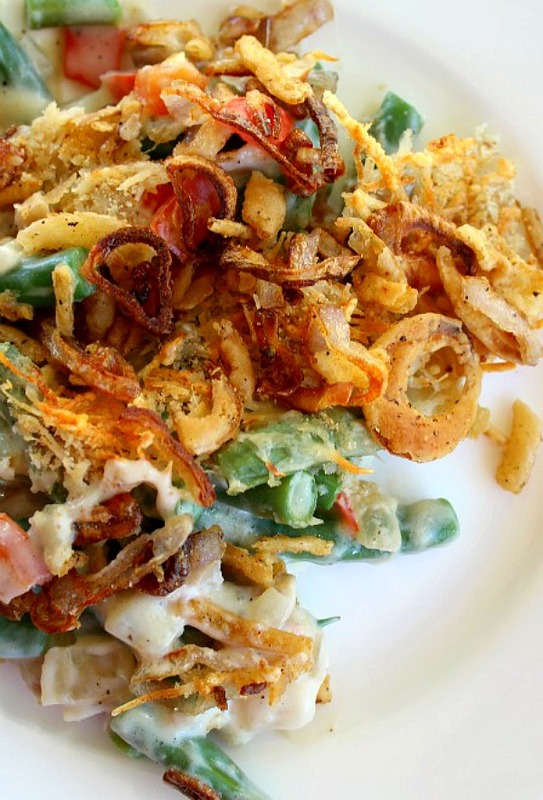 Gourmet green bean casserole is crunchy and creamy, cheesy goodness all at once. If you’re pressed for time or just don’t want to take the extra step of sautéing the shallots to combine with the fried onions, it will still be delicious and satisfying. The shallots just give another fresh and crunchy bite. The Parmesan cheese layered in the casserole is subtle but compliments the roux that you flavor with cayenne and nutmeg. A traditional green bean casserole gets a gourmet twist with the addition of a red bell pepper and grated Parmesan cheese. In a large skillet over medium heat, melt 2 tablespoons butter. Add onion, and saute until it begins to soften, about 4 minutes. Add bell pepper and mushrooms, and cook until softened and most of the liquid has evaporated, about 8 minutes. Season with 1 teaspoon salt and 1/4 teaspoon pepper. Set aside to cool. Prepare an ice bath: Fill a large bowl with ice and water; set aside. Bring a saucepan of water to a boil. Add beans, and cook until bright green and just tender, 4 to 5 minutes. Drain, and plunge into ice bath to stop cooking. When cooled, toss drained beans with mushroom mixture; set aside. Melt the remaining 4 tablespoons butter in a medium saucepan over medium-low heat. Add 1/4 cup flour, whisk constantly until mixture begins to turn golden, about 2 minutes. Pour in milk, and continue whisking until mixture has thickened, about 3 minutes. Stir in cayenne, nutmeg, and the remaining teaspoon salt and 1/4 teaspoon pepper. Remove from heat, and let cool to room temperature, stirring occasionally. Pour over beans, and toss to combine. Butter a 9-by-13-inch glass or ceramic baking pan. Spread half the green-bean mixture over the bottom. Sprinkle on half the grated Parmesan, and spread with the remaining green beans. Combine the remaining Parmesan and the breadcrumbs, and sprinkle over casserole. Cover with foil, and refrigerate until about 45 minutes prior to serving. You may prepare to this step and refrigerate for 2 days prior to finish and serving. Heat canola oil in a medium skillet over medium-high heat. Toss shallot rings with the remaining 2 tablespoons flour. Fry the shallots in batches, turning frequently, until golden brown. Transfer to paper towels to drain. Set aside. Preheat oven to 350F degrees. Cook casserole covered in the foil, for 25-30 minutes, until heated through. Remove foil. Mix saute'd shallots with approximately 1 cup of the canned or packaged fried onions. Sprinkle on top of casserole, reduce heat to 325F and cook another 10 minutes. Another keeper from the pro!!! I am making this for sure this year!! !